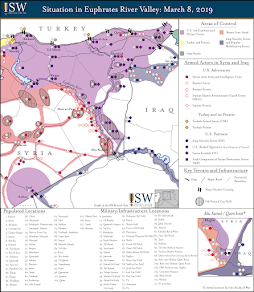 Turkey Brief is an intelligence summary (INTSUM) produced by the Institute for the Study of War (ISW). 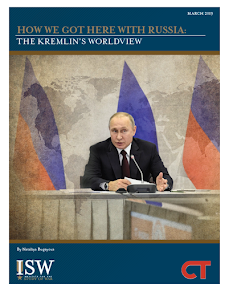 This ISW INTSUM series sheds light on key trends and developments related to the Turkish government’s objectives and its efforts to secure them. Key Takeaway: Turkey is deepening its strategic cooperation with Russia as the U.S. draws down its forces in Syria. Turkey is strengthening its naval coordination with Russia in the Black Sea and negotiating to expand bilateral economic ties. In Syria, Turkey and Russia agreed to create a joint coordination center to conduct joint military patrols along frontlines in Northern Syria on March 14. They are also working together to begin trade from Turkey into regime-held parts of Aleppo Province. Turkey’s deepening cooperation with Russia undermines the cohesion of NATO and jeopardizes the prospects for a deal between the U.S. and Turkey to stabilize Eastern Syria. Turkey is expanding its strategic cooperation with Russia. Turkish President Recep Tayyip Erdogan has repeatedly chosen to fortify his relationship with Russian President Vladimir Putin at the expense of Turkey’s alliance with NATO. Erdogan has taken a number of major steps toward a strategic realignment with Russia in 2019. Military: Erdogan has decided not to meaningfully challenge Russia’s increasingly assertive posture in the Black Sea. Turkey conducted a joint naval drill with Russia in the Black Sea on March 8 despite mounting international pressure on Russia after its escalation against Ukraine in the Kerch Strait in November 2018. The exercise marked only the second joint maneuver between the two countries since Russia formally suspended its participation in the Black Sea Naval Cooperation Task Group in response to the downing of a Russian Su-24 ‘Fencer’ fighter jet by Turkey in November 2015. Erdogan likely seeks to avoid disrupting the final constructions stages of the joint TurkStream Pipeline which runs under the Black Sea from Russia through Turkey. Commercial: Russia agreed to double import quotas for agricultural products from Turkey after a meeting between Erdogan and Putin in Moscow on January 23. The deal will help Erdogan stabilize rising food prices, which he has also attempted to mitigate through nationwide subsidies ahead of local elections in Turkey scheduled for March 31. Turkey and Russia may separately be nearing a milestone agreement to resume visa-free travel for Turkish citizens to Russia. Turkish Foreign Minister Mevlut Cavusoglu announced a possible breakthrough after months of negotiations on March 1. The Kremlin punitively suspended visa-free travel agreement with Turkey in November 2015. Erdogan and Putin will hold their next meeting on bilateral trade and economic ties in Moscow on April 15. Defense: Erdogan reaffirmed his intent to purchase the Russian-made S-400 Surface-to-Air Missile System (SAMS) throughout February 2019 despite significant pressure from the U.S. that included threats of possible sanctions. Erdogan also rejected an counteroffer from the U.S. to provide the Patriot SAMS to Turkey. NATO Supreme Allied Commander Europe / U.S. EUCOM Commander Gen. Curtis Scaparrotti recommended against providing the F-35 ‘Lightening’ fighter jet to Turkey due to risks to NATO on March 5. Erdogan subsequently stated that Turkey could purchase the Russian S-500 SAMS in addition to the S-400 in a signal of his determination to pursue closer defense ties with the Kremlin on March 6. Turkey is also deepening its cooperation with Russia in Syria even as the U.S. executes a partial drawdown in Eastern Syria. Russia and Turkey have taken steps to slowly negotiate an expansion of their coordination in Syria. Putin, Erdogan, and Rouhani met under the auspices of the Astana Process on February 14, where they likely agreed to the contours of future cooperation in Northern Syria. Turkish Defense Minister Hulusi Akar and Russian Defense Minister Sergey Shoygu previously reached a “mutual understanding” on cooperation in Idlib Province on February 11. Russian and Turkish military officials held a series of meetings on March 11 to discuss the developing situation around Idlib Province as well as possibly the status of the contested town of Manbij, which likely produced a deal on the specific routes of future joint patrols near Tel Rifaat north of Aleppo City. Turkish Foreign Minister Mevlut Cavusoglu and Russian Foreign Minister Sergey Lavrov similarly planned to discuss bilateral issues including Syria in a meeting in Turkey on March 12 that has been delayed twice due to reported scheduling difficulties. Greater Idlib Province: Turkey and Russia are implementing the Memorandum of Understanding (MoU) signed by Erdogan and Putin on September 18, 2018, which called for coordinated patrols and enhanced functions for a joint Iranian-Russian-Turkish Coordination Center. Both countries formally agreed to create a bilateral joint coordination center on March 14 to oversee their deepening military cooperation in Idlib Province after Turkey announced plans for joint military patrols with Russia on March 8 and conducted a patrol on the same day along the strategic M-5 Highway south of Aleppo City. Turkey subsequently conducted a second frontline patrol in Idlib Province without Russia on March 17. Joint patrols will likely follow in coming weeks. The Turkish Armed Forces deployed additional reserves into Greater Idlib Province to prepare for expanded coordination throughout February and March 2019. Turkey and Russia’s coordinated military operation in Idlib Province will likely set conditions for the resumption of traffic along the key M-4 and M-5 Highways, a goal stipulated in the September 2018 MoU. Greater Idlib Province: Turkey may also be providing targeting intelligence for Russian and Syrian airstrikes against al Qaeda-linked forces in Northern Syria despite denials of such coordination from Turkey. Turkey may be attempting to gain greater freedom of maneuver in Greater Idlib Province and circumvent constraints imposed by al Qaeda’s affiliate in Syria Hay’at Tahrir al-Sham (HTS). HTS accompanied the initial deployments of the Turkish Armed Forces to frontlines in Idlib Province that began in October 2017 and may have delayed at least one of the frontline patrols conducted by Turkey in March 2019. Turkey may also have agreed to provide intelligence on HTS as a concession to Russia. The Russian Foreign Ministry stated that HTS was attempting to collapse the implementation of the Russo-Turkish MoU on Northern Syria in November 2018. Putin later announced that Turkey and Russia would take additional steps to stabilize Idlib Province against al Qaeda following a meeting with Erdogan on January 23. Aleppo Province: Turkey and Russia are negotiating a similar cooperation agreement in Northern Aleppo Province. Both countries seek to reopen trade between Turkey and Syria by creating a suitable security environment along the highway between Aleppo City and the opposition-held town of Azaz on the Syrian-Turkish Border. Erdogan aims to stimulate Turkey’s faltering economy by integrating his domestic market with markets in Northern Syria. The Kremlin aims to use renewed trade to boost its narrative of normalization under Syrian President Bashar al-Assad. Turkish and Russian Armed Forces conducted their first joint patrol near Tel Rifaat north of Aleppo City on February 14. Turkey later announced the re-opening of the key Bab al-Salama Border Crossing north of Aleppo City on March 5. Turkey and Russia will likely conduct additional such patrols. The Turkish Defense Ministry confirmed ongoing efforts for further joint patrols near Tel Rifaat on March 12. Manbij: Turkey may agree to a takeover of the contested town of Manbij in Eastern Aleppo Province by Russia as the U.S. reduces its footprint in Northern Syria. Erdogan is dissatisfied with progress on a roadmap between the U.S. and Turkey to remove the Syrian Kurdish YPG from Manbij. Erdogan may thus seek a separate deal with Russia to supplant the U.S. in Manbij regardless of withdrawal ordered by the Trump Administration. Turkish Presidential Spokesperson Ibrahim Kalin stated that Russia agreed to implement the Manbij Roadmap on February 4. The Kremlin reportedly reached a verbal agreement with Manbij Military Council Co-Chair Abu Adel on March 9 to protect Manbij from Turkey in the event of a withdrawal by the U.S. The Russian Armed Forces previously began joint patrols with the Syrian Democratic Forces (SDF) west of Manbij on January 7. Turkey’s growing cooperation with Russia undermines NATO cohesion and jeopardizes the prospects for a deal between the U.S. and Turkey to stabilize Eastern Syria. The Kremlin’s cooptation of Turkey could disrupt the consensus-driven decision-making of the NATO North Atlantic Council. Russia could ultimately use Turkey’s dissent to obtain a de facto veto on the application of force through Article 5 of NATO’s Washington Treaty. Erdogan has pursued separate negotiations between the U.S. and Russia over Eastern Syria since the U.S. announced its intent to withdraw in December 2018. He likely seeks to identify which actor will provide a more advantageous option to advance his interests in Syria. U.S.-Turkey Track: The U.S. is proposing the establishment of safe zone in Northern Syria secured by a residual force drawn from the U.S. and Europe. Turkish Defense Minister Hulusi Akar met with U.S. officials to negotiate the terms of this zone in Washington, D.C. on February 22. Erdogan nonetheless publicly rejected an international presence in any safe zone along the Syrian-Turkish Border the day after the meeting between Dunford and Akar. U.S. Presidential Advisor Jared Kushner was similarly unable to assuage Erdogan during a meeting in Ankara on February 27. The current status of the negotiations is unclear although U.S. officials have broadly characterized them as productive. U.S. Chairman of the Joint Chiefs of Staff Gen. Joseph Dunford stated that the U.S. and Turkey are refining an “initial concept” for Turkey’s security concerns in Syria on March 18. Dunford may be referencing the original proposal or a narrower agreement between the U.S. and Turkey that could include provisions for a greater monitoring presence for Turkey along the Syrian-Turkish Border. Turkey-Russia Track: Putin may currently be providing a more preferable option to Erdogan in Syria. Putin signaled his openness to possible military operations by Turkey in Northern Syria after a bilateral meeting with Erdogan in Moscow on January 23. Putin referenced the Syrian-Turkish 1998 Adana Agreement, which allegedly authorized Turkey to conduct counterterrorism operations up to five kilometers inside Syria if Damascus fails to eliminate safe haven for the Kurdistan Workers’ Party (PKK) and its affiliates inside of Syria. Erdogan and Putin could agree to conduct simultaneous operations against the SDF in Eastern Syria, exploiting the vulnerabilities of the remnant force left by the U.S.
Turkey and Russia’s alignment over Syria may still falter, however. Syrian President Bashar al-Assad aims to limit the expanding economic integration and political influence held by Turkey in Northern Syria in order to retain leverage in future negotiations to end the Syrian Civil War. Assad continues to conduct airstrikes against Idlib Province in an attempt to assert its continued independence in the face of deals between Russia and Turkey. He also could exploit an influx of trade to spoil an agreement by siphoning off goods at a sufficient rate to provoke reprisals from Turkey. Pro-regime forces have systematically confiscated goods from Turkey along frontlines in Northern Hama Province since February 2019. Al Qaeda in Idlib Province could also spoil the agreement by attacking future joint patrols or commercial trade to impose cost on Turkey. The U.S. is currently unlikely to achieve a change in Erdogan’s behavior and close the widening strategic gap with Turkey. The U.S. has not publicly rebuked Turkey’s military cooperation with Russia in Syria. Turkish Defense Minister Hulusi Akar and Acting U.S. Secretary of Defense Patrick Shanahan discussed the situation in Idlib Province ahead of the release of a statement by the U.S. State Department condemning airstrikes against civilians in Northern Syria on March 14. The statement reiterated the Trump Administration’s opposition to a pro-regime offensive into Idlib Province, which strengthens Erdogan’s leverage with Putin but does not fundamentally alter the current trajectory of Turkey’s relationship with Russia. Erdogan’s recent steps toward deeper alignment with Russia are emboldening Putin. Putin invited Erdogan to the opening ceremony of a mosque in the occupied Crimean Peninsula of Ukraine scheduled for March 22. If Erdogan accepts the invitation, it would mark a major inflection in Turkey’s long-standing opposition to Russia’s invasion of Crimea in 2014 and a major victory for Russia against NATO. “Russia Suspends Participation in BLACKSEAFOR Drills After Turkey’s Downing of Russian Jet,” TASS, November 27, 2015, http://tass(.)com/defense/839869. Deniz Acik, “Turkey Seeking End to Need for Visas with Russia,” Anadolu Agency, March 1, 2019, https://www.aa.com(.)tr/en/politics/turkey-seeking-end-to-need-for-visas-with-russia/1406513. [“Meeting Between Minister Akar and Russian Defense Minister Shoigu,”] Turkish Ministry of Defense, February 11, 2019, https://www.msb.gov(.)tr/SlaytHaber/1122019-06508. [“Military Shipments to the Syrian Border,”] Anadolu Agency, February 2, 2019, https://www.aa.com(.)tr/tr/turkiye/suriye-sinirina-askeri-sevkiyat/1381863. Izzet Mazi, “Turkey Reopens Key Border Crossing with Syria,” Anadolu Agency, March 5, 2019, https://www.aa.com(.)tr/en/economy/turkey-reopens-key-border-crossing-with-syria/1409698. “Minutes of the Agreement Signed by Turkey and Syria in Adana (Unofficial Translation) - 20 October 1999,” October 20, 1998, Turkish Ministry of Foreign Affairs, http://www.mafhoum(. )com/press/50P2.htm.